Hello everyone! I hope you have had a wonderful week! Today I wanted to play in a couple of challenges. I made this for MMSC45 and also for the Saturday Spotlight, to slick it up! Secret Crafter Challenge (Anything Goes). My card is 5 x 7 so it's a lot bigger than I usually make, and I had to photograph it flat, so I'm sorry about the ugly photo! This week's MMSC fancy option intrigued me to say the least! I had colored up this image from Serendipity Stamps with Copics, and decided to try it for this sketch, so I cut it all up! I then sponged T Holtz Distress Ink in Black Soot around all the edges, and attached them to a black piece of cs. I then embossed the whole thing 3 times with Ranger Ultra Thick Embossing Powder. It really gave a thick glossy shine. I had intended to crackle it at this point, but decided I liked the clean white tile look so left it. I think that qualifies it for the Crazy Challenge, which is simple and elegant. For the butterfly I stamped a second one, embossed it as well, bent the wings when it was still hot, and then attached it to the card. The corner treatments are Spellbinders. It's actually a simple card, and different for me, but I have someone in mind who I think will love it. If you hopped along with us on any part of our Our Daily Bread designs Anniversary celebration, please check out the ODBD Blog to see all the winners! Thanks so much for stopping by and have a blessed weekend!!! By far, no doubt, this is the most beautiful card I've seen made following that sketch. Thank you joining us at "Crazy Challenge" this week. Is real pleasure for us! Grace this is lovely - you are so talented and this is so elegant and stunning. Grace this is so elegant and sophisticated. The flowers are beautifully colored and that butterfly is just darling. Love this card!!! Don't you just love the brick wall technique...you have it perfected!!! Thanks for playing along with us this week at the Midnight Madness Sketch Challenge. AWESOME Grace WOW LOVE your tiled creation, amazing job!!! This is gorgeous Grace!! I just love your take on the MMSC, the tiles, the gorgeous flower and design!! Awesome take on the MMSC and Sat. Spotlight this week!! 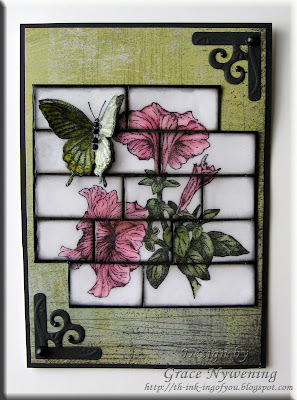 Wow, those flowers against the white background on the tiles just pops on your card! Love the butterfly, perfect touch. Colors you chose and your coloring are awesome. Thanks for joining the MMSC this week. Always a pleasure to view you card, Photo is fine! A 5 x 7 is different, isn't it? Very nicely done. Thanks for joining us at Midnight Madness. Grace, this is gorgeous. I love your tiles. kartka jest śliczna i inna. :) Lubię Twoje prace. Wow, this is stunning. Love the image and colours. The tiles are a fabulous effect. Wow Grace, this is really pretty! It so looks like tile pieces! Very nice and elegant! p.s. I am so pleased about the ODBD award!!!! This is beautiful Grace.. I love the tiled look. Really gives this card a unique look.. Great job.. Have a good weekend. Who cares what the photo looks like when you're too busy gazing at this gorgeous card!!! BEAUTIFUL my friend!!! OMG----- GRACE, this is incredible!! I LOVE IT!!!!! Gorgeous...Love your whole take on the sketch and your butterfly looks so real..AWESOME !! Thank you so much for joining in the fun this week at the Midnight Madness sketch challenge blog. 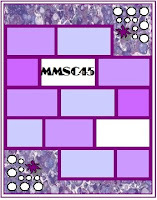 I wanted to just let you know that the MMSC46 Sneak Peek has been posted.